Posted: Tuesday, May 10, 2016. 12:26 pm CST. Posted. May 10, 2016. 11:45 a.m. CST. 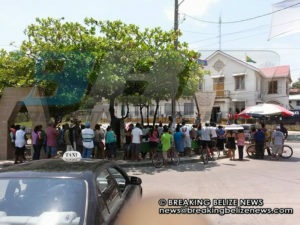 By BBN Staff: A small group of protesters gathered this morning in-front of the San Ignacio Police station in solidarity to the double murder of Miriam Mai and Daisy Miralda, as the alleged accused Security Guard Andy Bustillos was arraigned in court this morning for two counts of Murder. Breaking Belize News was made to understand the peaceful demonstration was organized in order to seek justice.